Plastics’ structural diversity is now being augmented by a further dimension: with suitable molecular configuration, they can also be used as electrical conductors and semiconductors (albeit with still limited mobility of the charge carriers). They thus serve as system components of “organic” and “printed” electronics. “Organic” because their transistors, sensors and LEDS are not based on silicon or gallium arsenide, but on carbon derivatives. And “printed” because two-dimensional circuit patterns can be printed “from the reel” with structural fineness of just a few tens of micrometres onto flexible and also transparent substrates by using conventional mass printing processes (flexo, screen-printing, inkjet). The e-readers from Amazon and Sony with “electronic paper” from E-Ink enjoy widespread popularity because of the energy-efficient, bistable principle of their electrophoretic displays. They are essentially ideal for presenting static content such as book pages.The next development step will bring forth lighter, flexible and maybe even roll-up e-readers and tablets without the heavy cover glass. The most progress here has been made by Plastic Logic that produces backplanes of organic thin film transistors (OTFTs), i.e. the active matrix for individual pixel control. 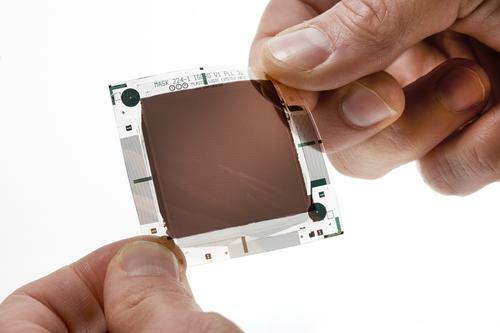 Organic photovoltaics (OPV) is already commercially available as local supply sources for mobile data and consumer devices. The long-term prospects include applications in the envelopes of vehicles and buildings (BIPV, building-integrated photovoltaics).Available as system components are printed data memories – in the form of the ferroelectric, non-volatile memory films of the Norwegian manufacturer Thinfilm. These can be combined with a transistor logic produced at contract researcher PARC in California to yield software-addressable memory modules. With a printed thermistor as a temperature sensor and a display field together with a printed battery, they can be extended into a complete measuring system.